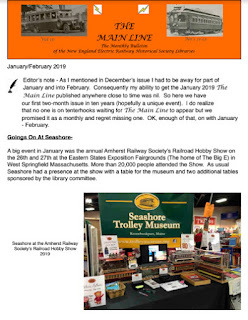 The March 2019 Main Line is available for your reading pleasure! 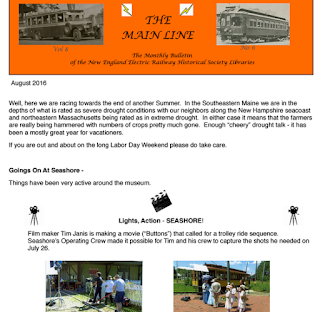 Ed Ramsdell, former Chair and current Friend of the Seashore Trolley Museum Library Committee, has been quietly turning out our favorite newsletter, the Main Line, every month for the past ten years! Every issue is jam-packed with interesting news and intriguing trolley lore. We have a new blog page that has all of the back issues of the Main Line for your perusing pleasure. And THANK YOU, Ed. for all of your hard work over the past ten years! 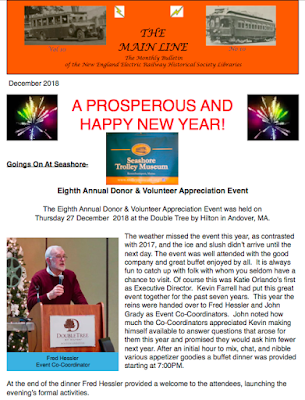 The December 2018 Main Line Newsletter is here! Construction car #69 of the Portland Railroad Company working the lines in Portland. 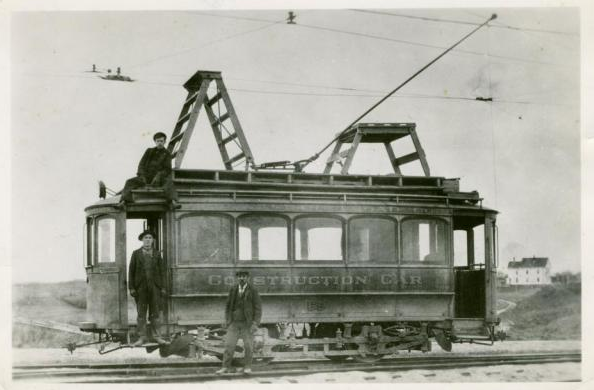 In this photograph, the car - also called a line car - is being used to maintain the wires that provide the electricity that powers the trolley cars. NEERHS Library collection. View on Maine Memory Network here. After a longer-then-planned construction period, our new website/blog is up and running! We're working on consolidating our internet presence from all across the web into one convenient place where you can find our blog, links to our various collections, contact information, and more. The August 2016 Maine Line is Up!